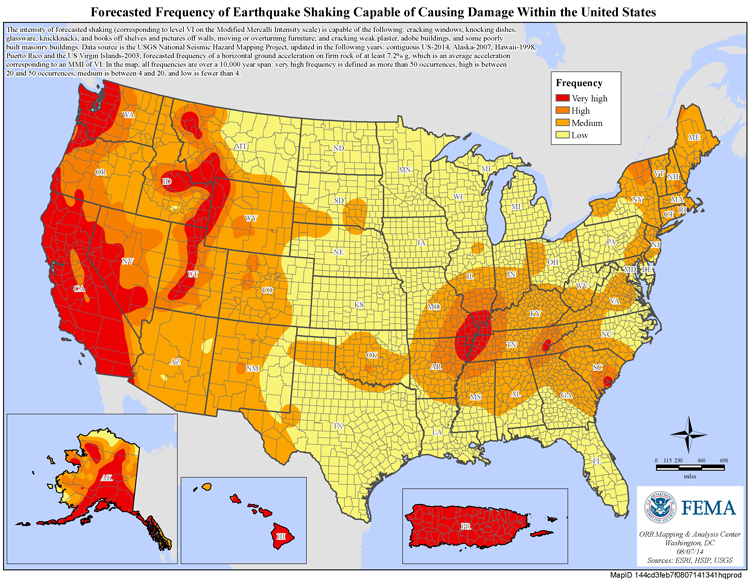 Among all of the states, California is notorious for having the highest level of seismic activity. Just alone in the past 24 hours, California has had 16 earthquakes, all of which are of magnitude 1.5 or higher. Although we may not feel these earthquakes, we should always prepare for the next big one to strike. It’s been 23 years since the last great earthquake struck California, a 6.7 magnitude in Northridge devastated many homes and lives. Everyone knows about the most catastrophic earthquake of 1906 in San Francisco where hundreds of thousands of lives were affected. We’re due for the “Big One” and we need to make sure we’re prepared. Seismologists and geologists estimate that based on the recent seismic activity in California, an earthquake of at least 7.0 magnitude can occur at any moment. With constant tectonic shifts and one of the largest inhabited faults in the world, California is a powder keg, ready to spark with the next earthquake. Although California’s vast abundance of beautiful beaches, lush forestry and endless sight-seeing opportunities may make it very tantalizing to live, the fear of the next big earthquake lingers in the back of every Californian’s mind. Even if it’s a lingering thought, we should always make it a fact to be prepared. Having the right supplies readily available could mean weathering the storm for rescue, or prolonged survival until the infrastructure is back online. In the event of a catastrophic earthquake, we as Californian’s should already have plans and frequent drills to practice and implement these plans. The greatest fear is the fear of the unknown. We won’t know when the next “Big One” can happen, but we can prepare to ensure the safety and survival of our loved ones. Some key items that you should keep in hand include: flashlights, portable battery-operated radios, water supply and something to start a fire with. Most of the injuries and deaths do not occur during the earthquake or because of the earthquake but rather the repercussions of the earthquake. As California is lush in its forestry, wildfires could be imminent in a post-earthquake scenario. Avoiding structures that have a high potential of toppling over and street fixtures including streetlights or lamps could reduce the potential for danger for you or your loved ones. It is estimated that an earthquake of 8.0 magnitude can lead to destruction in catastrophic proportions. Researchers estimate that there could be almost $200 billion dollars in damage, 50,000 injuries and the potential for 2,000 deaths. However, it must be understood that the death toll could be attributed by many factors including: fire, famine, dehydration and other natural causes. Having the right preparation and supplies can make this estimate much less drastic. Don’t be another statistic: expect for the best, prepare for the worst. Global Environmental Network, Inc. prides ourselves in keeping our clients well-informed of the latest changes in environmental changes, federal and state regulations. Our state-of-the-art training and engineering facility is one of the largest in California. We have offices strategically placed in California to offer optimal coverage for all of your environmental, health and safety needs. With almost 3 decades of experience in environmental, health and safety training and engineering, we want to ensure that your firm is safe, up-to-date and certified. We also provide courses that could potentially help in the event of an emergency. We offer on-site First Aid, CPR and AED training in accordance with the American Heart Association’s standards. A measure (OSHA 29CFR1910.38) passed in 2002 by the United States Department of Labor‘s OSHA requires all firms to write, develop and implement an Emergency Action Plan (EAP). The Emergency Action Plan requires for written and oral plans to be developed in the event of an emergency. Firms with 10 or fewer employees may be able to communicate an oral emergency action plan in lieu of a written one. Some items that must be included within an Emergency Action Plan include: procedures for reporting a fire or other emergency, and procedures for emergency evacuations including types of evacuation and exit route assignments. Other procedures include designation of the employees to remain that operate critical plant operations prior to evacuation, accounting for all employees post-evacuation and medical duties in the event of an emergency. Each name or job title of every employee who are responsible for the Emergency Action Plan must be laid out and their duties within the EAP. Not only will employees and employers must be accountable during an emergency situation, an alarm system must be in place to comply with 29 CFR 1910.165. Employees must be trained and proficient within the EAP to ensure safe and orderly evacuations in the event of an emergency. This should be reviewed yearly with every employee and should be refreshed yearly. IF YOUR FIRM DOES NOT HAVE AN EAP, SERIOUS FINES CAN BE IMPOSED. A press release from OSHA on April 8th, 2013 stated that CVS Pharmacy Inc.’s Albany store was non-compliant of the OSHA 29 CFR 1910.38. Based on the citation, a proposed $40,000 in fines were imposed on CVS Pharmacy Inc. CVS’s Red Hook retail store was fined for repeated violations for the lack of an EAP. They were previously cited in 2010 and 2011 for similar hazards at other stores. The greatest takeaway from this press release is that each store MUST HAVE a SPECIFIC Emergency Action Plan and CANNOT USE a boilerplate EAP across multiple stores. Every evacuation plan as well as the potential hazards can vary from location to location. These serious fines can lead to great financial distress within a company or even bankruptcy. GENI CAN HELP YOUR FIRM. Keep your firm up-to-date with OSHA’s regulations. Call us today to see if we can help write, develop or revise your firm’s Emergency Action Plan. KEEP YOUR EMPLOYEES OSHA CERTIFIED! GENI also offers courses such as the OSHA 10-Hour Training and OSHA 30-Hour Training to keep your employees compliant with the most up-to-date OSHA regulations. Check out www.safetygeni.com for all of our other offerings including SWPPP plans, QSP/QSD training, HAZWOPER Training, Lead and Asbestos Training, Heavy Equipment Training, as well as many safety courses such as: fall protection, trenching and shoring, etc. Download our FREE Emergency Supplies Kit Checklist Here! Ensure that your firm is safe and has the enough supplies to weather any disaster.